Choose All Green Electronics Recycling to efficiently recycle your stereo player using our professional world-class facilities. Pickup or drop-off available nationwide. Got an old stereo player taking up room in your living room, garage or basement? It’s time to get round to recycling it – it may not be of much use to you now but at All Green Electronics Recycling we can repair and resell it, or recycle all of the precious materials from it. Don’t throw that stereo player in the trash, leaving it to end up in a landfill. Discover how we can breathe some new life into your old stereo player. All Green Electronics Recycling disposes of unwanted equipment in a manner that’s ecologically friendly, developing a new strategy for equipment disposal for each business that replaces the one-size fits all recycling process. In addition, the strategy guarantees a smaller cost and better conservation of the environment. The process of developing new purposes for equipment can potentially generate revenue on top of recycling the metal that originates from the equipment. MANY LOCATIONS IN THE U.S.
With a large quantity of IT selling trucks distributed across the U.S., unwanted stereo equipment can be picked up at any given location without the burden of high transportation costs. The handling, labeling, and the displacement of the equipment is accomplished through the efforts of All Green Electronics Recycling specialists. Customers can track their packages through an online management portal to ensure that their equipment is safely transferred to its designated location and to get an insight into the stereo player recycling process. Careful consideration and care is taken towards the proper disposal of equipment, since some items contains important data linked to an individual’s personal information. With possession of R2 Responsible Recycling, ISO 14001 certifications, All Green Electronics Recycling provides services that prevent the disclosure of the private data found on recycled equipment and it is managed meticulously once the item is in our recycling stream. The reputation of individuals and business can be damaged if equipment is recycled in a manner that does not follow equipment recycling laws in the U.S. All Green Electronics Recycling takes the extra initiative to ensure that all equipment processed through our database is completely recycled to the full extent possible. Not only are the minimum guidelines for recycling laid out by the government exceeded, but we offer full disclosure and documentation on every step that was taken to decommission your equipment. You can trust All Green Electronics Recycling, your partner in recycling from start to finish. Amid the rapidly evolving world of technology, cycling through devices and gear that was once cool but is now obsolete is common. Handheld smartphones, iPods and cameras are easily discarded, thrown away with little thought given by the owner. Unfortunately, the larger the product, the larger and more complex the disposal of it is. With the electronic recycling of stereo players, we believe we have the right solution. Before tossing an old stereo player into the dumpster, think of ways you can keep the old machine feeling wanted before mindlessly tossing it out to be slowly disintegrated through the millennia in a landfill. All Green Electronics Recycling caters exactly for this occasion. 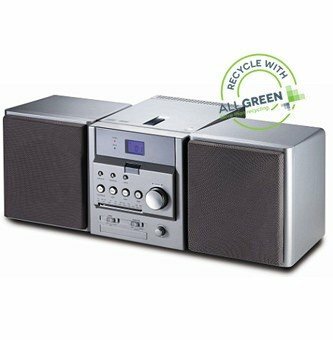 Stereo players recycling may not sound like it is in popular demand, but it is a streamlined solution to your problem of having an obsolete speaker system and plays a big part in protecting our environment. We offer the flexibility to either pick the stereo up from you, or you can conveniently drop off the old product at any of our company’s many nationwide locations. This should be the excellent, immediate solution for many obvious reasons. Frequently, you can be awarded payment for the discarded technology, and the ethical process All Green Electronics Recycling follows allows for the equipment to be re-used in the future or recycled for its precious metals. In case you might still prefer to throw away your used equipment as it appeals to you as the easiest option, keep in mind that these stereos contain dangerous toxins such as brominated flame retardants, mercury and lead, which could cause a significant negative impact on the environment and local water supply. The recycle rate of larger electronics such as stereos stands at below 40 percent. The accruement of so many electronics is being compounded daily by ignorant discarders, and is simply a waste of precious material. It is becoming a greater hazard to the environment by the year. This then leads into the rhetorical question: would you want to be part of the problem or part of the solution? You have absolutely nothing to gain from tossing out your old stereo, but you would potentially have a lot to gain, both in a financial regard and by choosing to not compromise an already fragile environment. It is unmistakably the smart, most practical choice. 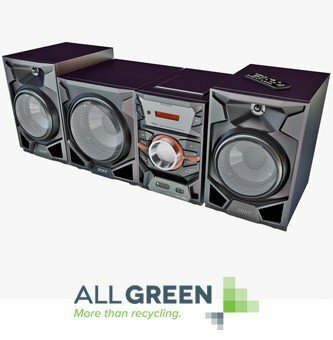 Contact All Green Electronics Recycling at any time to dispose of your old equipment through our innovative stereo players recycling system.